I visited several cemeteries during my visit to Nebraska in September 2015. But one of them was actually in Missouri. 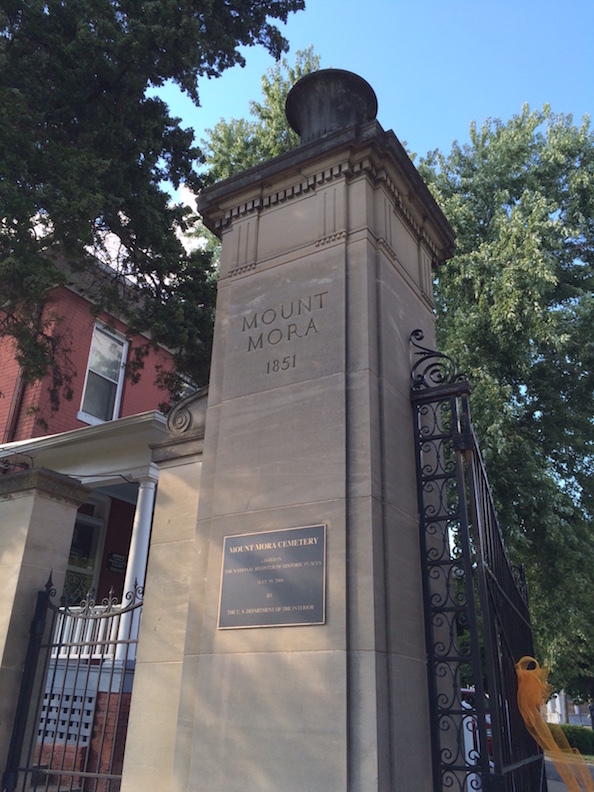 My other aim for visiting St. Joseph was to visit the city’s oldest and grandest cemetery, Mount Mora. Established in 1851, Mount Mora is on the National Register of Historic Places. I couldn’t find out what the current acreage is but it was originally 20 acres. Mt. Mora was established in 1851 and originally covered 20 acres. I didn’t do a great deal of homework on Mount Mora. By this time in my trip, I’d visited so many cemeteries that I wanted to amble through the stones and simply enjoy being there. But I did look up the people whose graves I saw later. One thing I noticed when I got up to the top of the hill was that Mount Mora has a lot of white bronze (zinc) markers, some the largest I’ve ever seen. It was a delight to see so many in once cemetery. Abbott Porter Goff, a native of West Virginia, was a successful merchant in St. Joseph. I couldn’t find out much about Abbott Porter Goff but he was a successful merchant in St. Joseph, having spent his early life and marriage in West Virginia. He and his wife, Susan, had eight children. A bound wheat sheaf with a scythe is a common motif on white bronze (zinc) monuments. 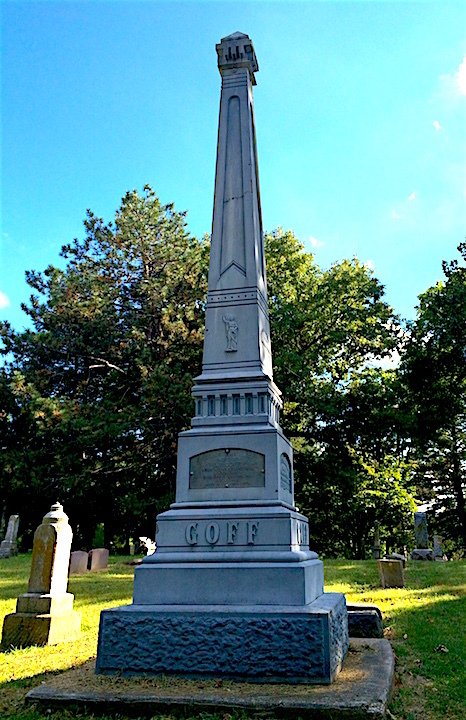 Their monument is a nice example of a white bronze monument, complete with a bound wheat sheaf/scythe on the side. I see this often on white bronze markers, signifying a long and fruitful life in many cases. Since Abbott lived to 70, that makes sense. It also has Biblical overtones as a symbol of Resurrection. The Hutchinson/Ashton monument is one of the few white bronzes I’ve seen with a statue perched on top of it. 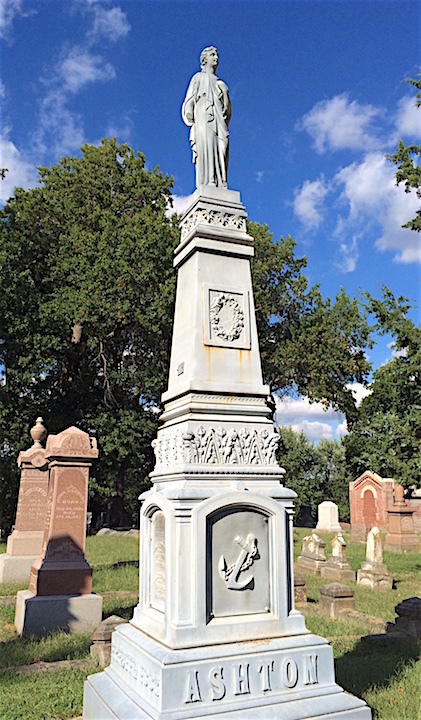 The Hutchinson/Ashton monument is another rare white bronze because it has a statue on the top. Sarah Aspinal, a native of England, married William Ashton (a cloth manufacturer) and came to America in 1824. Ashton died in 1829, leaving her with two children. Sarah married William Hutchinson in 1832 and they eventually moved to St. Joseph. In her obituary, her son Thomas Ashton is referred to as “Col. Ashton” although the military records I found on him indicate he had a physical disability that prevented him from serving. The flower border on the Ashton/Hutchinson monument is especially lovely. A smaller white bronze monument got my attention because of some of the more uncommon symbols on its sides. 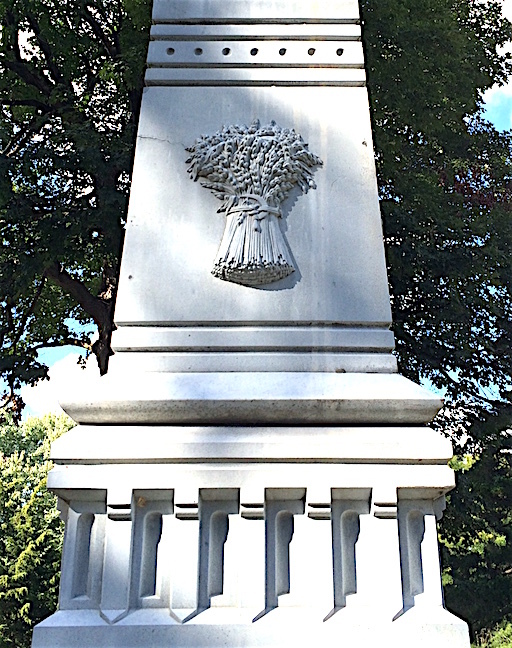 The white bronze monument for William Strop has some uncommon symbols on it. A native of Kentucky, William Strop was the son of German immigrants. He served in the Union’s Fifth Regiment, Company L of the Kentucky Cavalry during the Civil War. By 1870, he and his wife, Carrie, were living in St. Joseph and he was earning a living as a brick mason. In 1880, he and Carrie had a son and three daughters. For reasons, unknown he died in 1881 at the age of 35. 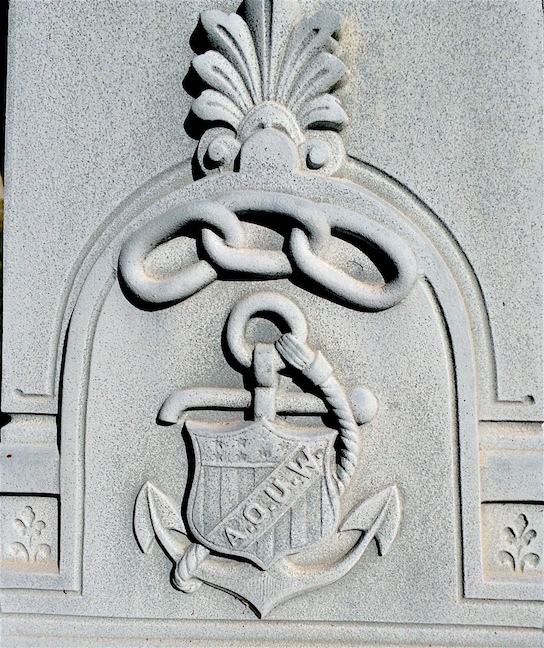 William Strop’s monument has both the symbol of the Independent Order of Odd Fellows and the Ancient Order of United Workman (AOUW). The three-link chain in the photo above represents the Independent Order of Odd Fellows and is one I see on markers everywhere. The three links represent “Friendship, Love and Truth.” But the symbol below it was new to me. I learned that the AOUW was the Ancient Order of United Workman. The AOUW predates Modern Woodmen of America, established in 1868 by John Jordan Upchurch, a mechanic on the Atlantic and Great Western Railroad. His original idea was to create a fraternal order that might unite the conflicting interests of capital and labor, but he became more interested in improving working conditions for members and establishing an insurance fund. The emblems and symbols used by the AOUW have roots in Free Masonry, featuring the All-Seeing Eye, the Holy Bible, anchor, square and compasses, over which the motto “Charity, Hope and Protection” are displayed. By 1885, its membership numbered in excess of 318,000. William Strop may have had a child die in infancy. 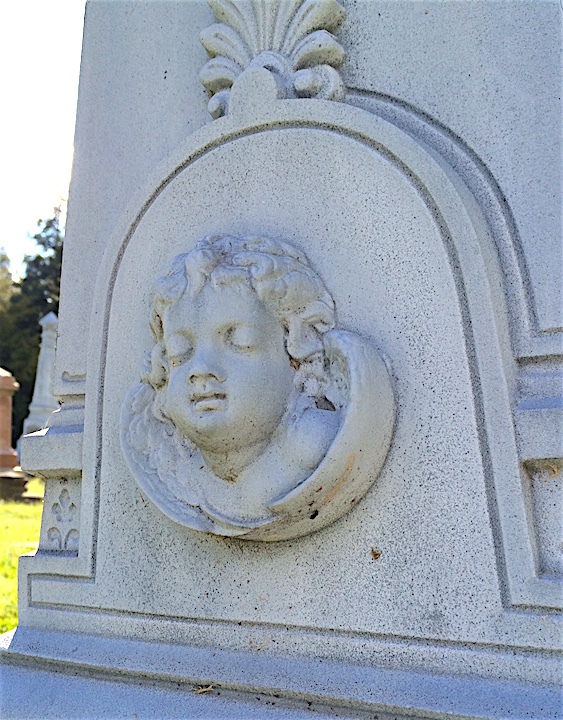 Another panel on this monument features a cherub. I suspect William and Carrie may have had a child who died in infancy. Census records indicate that the four children I saw listed lived well into adulthood but it’s highly possible there was one who died at birth or within the first years of its life. I’ve never seen a cherub on a white bronze monument, however. 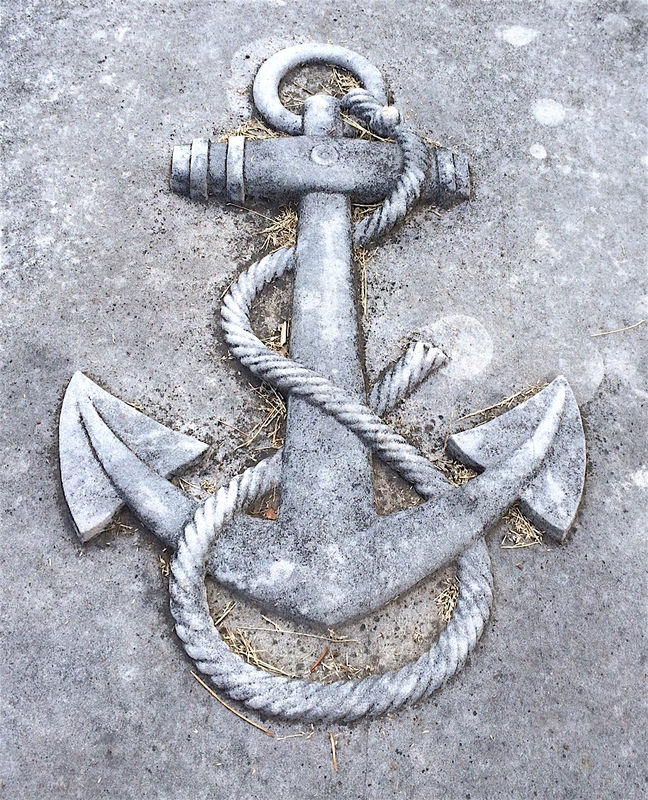 Many gravestones feature an anchor, which symbolizes hope or eternal life. It’s also a favorite on Mason graves, meaning well-grounded hope. However, once in a while I spot an anchor on an actual Navy or Marine veteran’s grave. 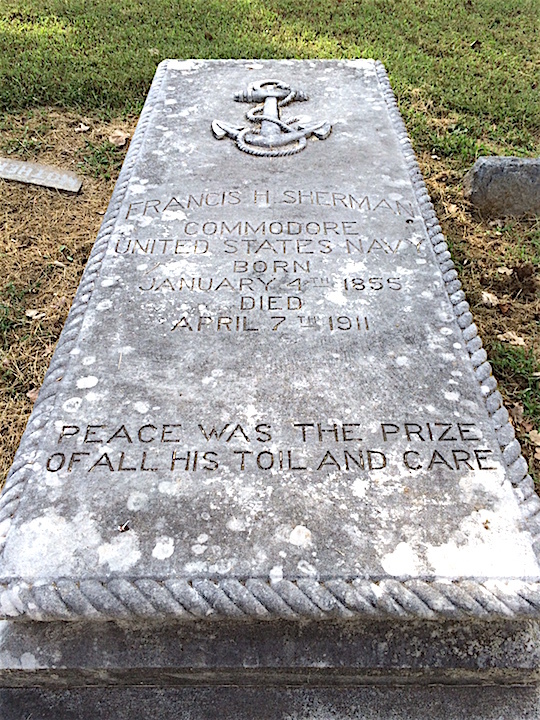 Commodore Francis Sherman’s last post (as a Lieutenant Commander) was on the U.S.S. Montgomery, stationed in Montevideo, Uruguay. Commodore Francis Sherman retired as one of the Navy’s last Commodores in 1901. Francis Sherman graduated from the U.S. Naval Academy as a mid-shipman in 1871 and served as an officer in Navy War Department. During the Spanish American War of 1898, he was a Lieutenant Commander in the North Atlantic Squadron in command of the U.S.S Passaic. Afterward, he served as adviser captain on the Navy Flag Staff and retired in 1901. One thing that’s particularly interesting about St. Joseph itself is that it was the starting point of the Pony Express, which only lasted 19 months in 1860 and 1861, and covered 2,000 miles. Mount Mora is the resting place of not only two Pony Express riders (Charlie Cliff and John Benjamin Harrison), but Israel Landis. He is often credited with helping create what’s known as a mochila, the leather mail pouches so critical to the Pony Express. 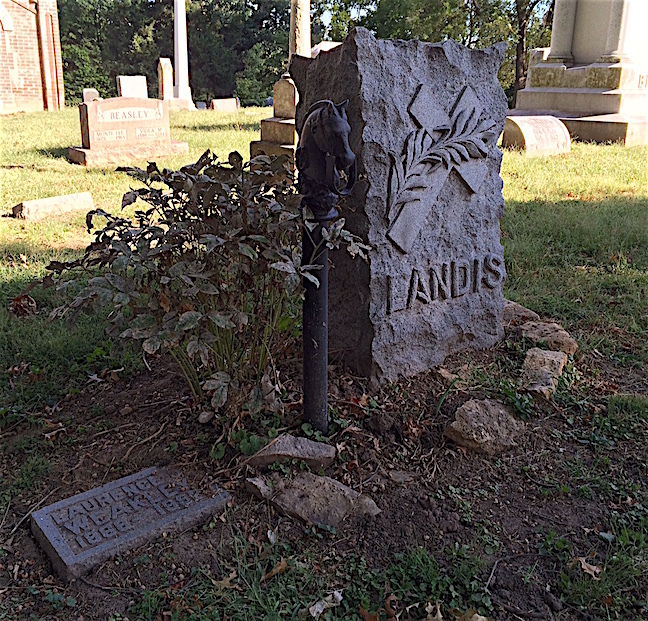 Oddly enough, I don’t recall seeing Israel Landis’ grave because I’ve since seen a picture of it. What I did see (and photographed) was this stone with an iron hitching post in the shape of a horse’s head. In my research, I saw a mention of this being a memorial to Pony Express riders. The one grave that’s next to it is of Lawrence Weakley, who married Israel Landis’ granddaughter, Jeanette Landis Weakley. I’m not sure which Landis this marker memorializes. The last thing I’m going to talk about is the Maud Vanderlinde mausoleum. 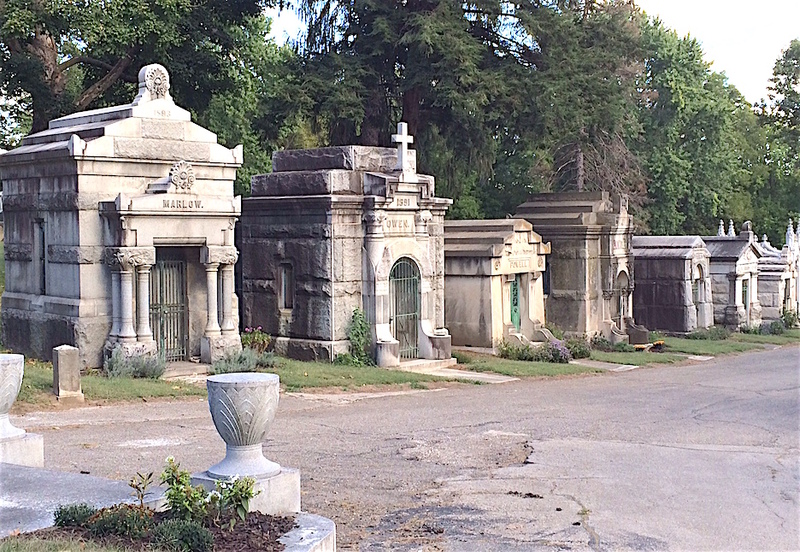 Mount Mora has 30 mausoleums, many of them ornate and glorious. I’ll get to those in future weeks. But Maud’s is so shrouded in legend that I feel the need to mention hers here. The popular story behind Maud’s death was that she died while she and her husband were passing through St. Joseph on their way west. She supposedly died in childbirth. Her husband was said to have asked a Native American chief to perform some kind of ceremony over her body to keep it preserved before placing her in the red brick mausoleum he had made for her eternal rest. Word around town was that if you peered inside the window of the mausoleum, you could see Maud’s casket resting on two sawhorses, her remains visible for everyone to see. The truth behind Maud Vanderlinde’s death is no less sad but much less dramatic. Thanks to her obituary and some digging on Ancestry.com, I was able to find out the real story. Maud (or Amanda as the 1880 U.S. Census indicates) was the daughter of John and Susan Vanderlinde, who married in 1869 in St. Louis, Mo. John was a surveyor for the U.S. Customs Office in St. Joseph. Maud was the only daughter of the Vanderlindes and contrary to the legend, she never married. She died at the age of 23 after a lengthy illness, a much beloved member of the community. 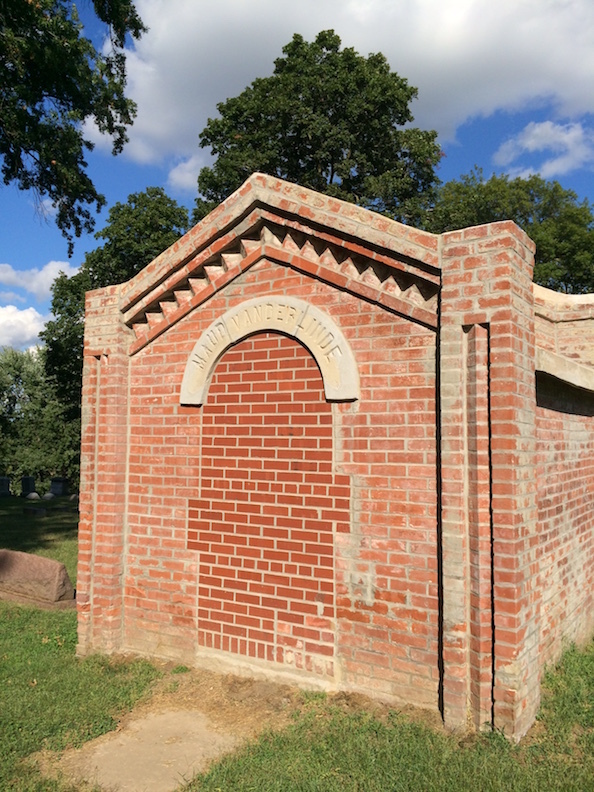 The mausoleum underwent some repairs in recent years and its doorway is now bricked up. The legend of her death as a young bride and expectant mother, however, has persisted over the years. In my next post, I’ll share the stories of Mount Mora’s Mauseolum Row. You won’t want to miss it! Thank you for a great article. Isn’t Mount Mora a wonderful place to visit. I hope to spend eternity there myself. I love your visits ! 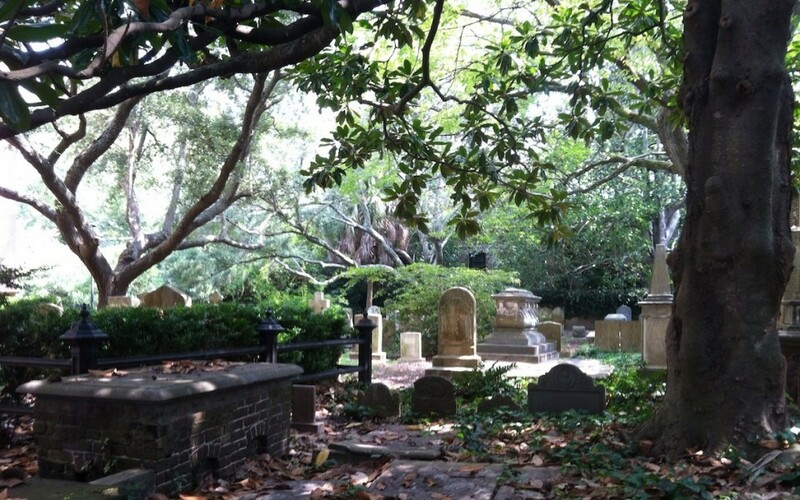 We love to tour cemeteries because of all the history there! As always, just a great big thank you! Thank you for including the Goff memorial on your page. 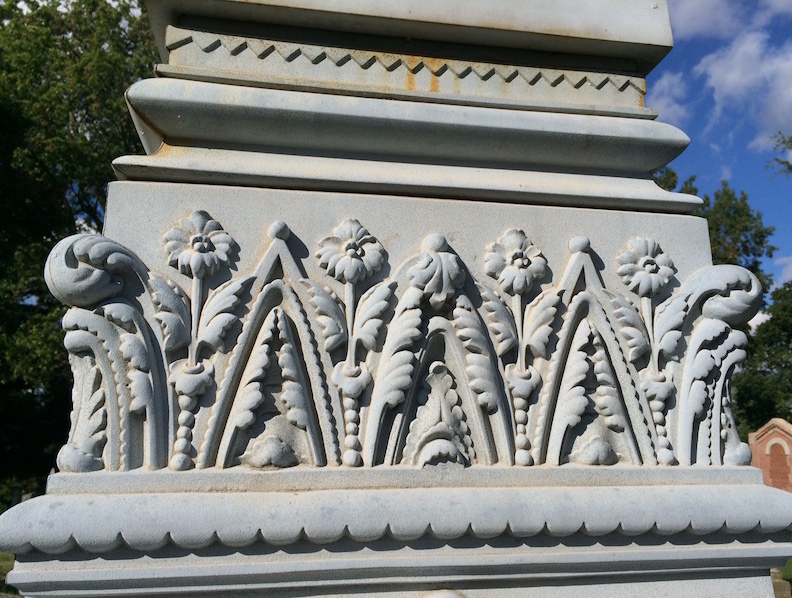 Not only is it beautiful but it is also the tallest zinc memorial in the cemetery. I am directly descended from the Goffs. Abbott Porter was a banker and president of the Missouri Valley Trust Bank. Among others the family has included a West Virginia Governor, House Representatives, and the Secretary of the Navy under President Hayes. Interesting! We have that exact horsehead hitching post in our front yard here in St. Joe. As it is in the yard and not exactly as close to the street as one would expect a hitching post to be, (unless the street has moved in years past which is possible) I often wondered the history behind it. I believe there was probably a home on our property before our current home was built, but I have no idea how to go about researching that. Thanks for the food for thought!